Last Thursday I decided I would potty train Tom. In my mind it made sense since we’d be home for the weekend and he had no school for the upcoming week. The perfect storm of home-bound-ed-ness. So I went to Pinterest (of course) and found a link that I liked and decided that’s how I would potty train Tom. Mainly because it said, “Potty Train In 3 Days! !” on the graphic. And potty training advice from strangers on the Internet appealed to me. 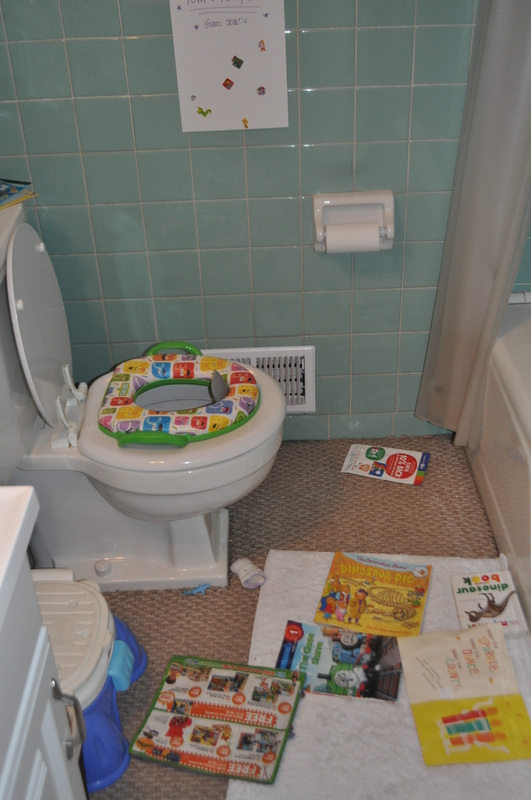 According to my new stranger friend, the first day I just needed to be armed with books, stickers, enthusiasm and a timer to go off every 20 minutes so I could put Tom on the potty. My intention was to put him on the potty as soon as he woke up, but I chickened out because he woke up kinda groggy/sad. But around 9 a.m., I started the timer thing. He tee-teed in the potty! The rest of the day we hung out around the house, drinking a lot of fluids and tee-teeing in the potty. Even though Tom has showed no real interest in stickers before, he still was excited when he picked one out to put on his chart. And even though Tom had never shown any interest in the potty before (actually screaming “NOOOOOOOOOOOOOOO!” if you asked him if he wanted to use it) he got into it immediately. He had accidents that first day (I think 5? ), but that was to be expected. But he had far more successes. And that first day, Kev took him out for frozen yogurt to celebrate his great day. And while they were eating it, Tom told Kevin he had to tee-tee. So Kevin took him out to our van — where we’d put the portable potty — and he used it! The second day, there were still some accidents — but I learned that he was learning to hold it longer. And he would always go when I told him it was time. He just never wanted to tell me if it was time. The third day, he had a few accidents, but it was much better because I was getting the hang of when to put him on the potty. He just amazed me really. I think he had one accident on both Monday and Tuesday. I kinda want to brag about this and talk about this ALL THE TIME right now, but I’m really trying not to. I’m just thrilled and impressed with Tom. I feel like he’s matured a lot over the past couple months, and this is another example of that. He’s been a doll about it. He loves knowing he’s doing a good job. He’s so proud of himself, and I love seeing that in him. Tom uses the potty now. In Thomas the Train underpants. 2 Responses to Potty Training Super Star. that is really impressive…. I mean it! Go Tom!